The family’s vision for this beach house was to create a legacy home for generations to come. The modern interiors feature unconventional design solutions, state of the art technology, and the ability to accommodate multiple families simultaneously. 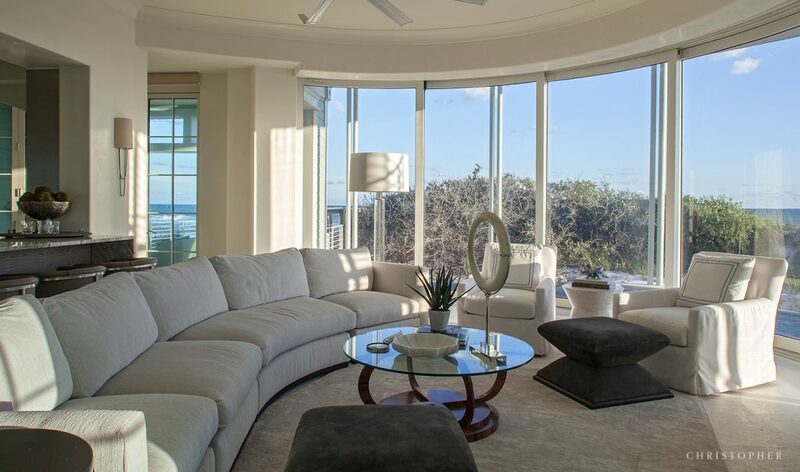 To take full advantage of the amazing beachfront views, the second and third floors have motorized radius glass walls that open and stack behind curved walls, creating living spaces that blend the inside with the out. This family retreat is located in Florida’s prominent 30A community. Within this Coastal Luxury Residence, there are four kitchen areas, a theatre, ten bathrooms, four master suites, and the ability to accommodate twenty-eight people comfortably.